The upper echelons of America’s modern agricultural prowess are betting that massive mergers will allow it to seize powerful new gene editing technologies to fuel much needed growth. All but one of the “Big Six” seed and agrotechnology companies, including number one ranked Monsanto Co., saw revenue declines in 2015. Farmers are buying less seed and fewer chemicals as U.S. farm income has plummeted 30 percent from a 2013 high. Mounting pest and weed resistance to genetically engineered (GE) seeds has also begun to worry farmers, as crop yields have begun to flatline in the last few years. For the first time since biotech seeds were introduced, in 2015 the area of acreage planted globally declined by 1 percent, according to a nonprofit that tracks the data. Capped off by the Sept. 14 announcement of Germany-based Bayer AG’s proposed acquisition of U.S.-based Monsanto, five of the Big Six have now announced mega mergers valued at approximately $145 billion. If approved by antitrust regulators, a new “Big Three” would be Syngenta-ChemChina, Dow-Dupont, and Bayer-Monsanto. 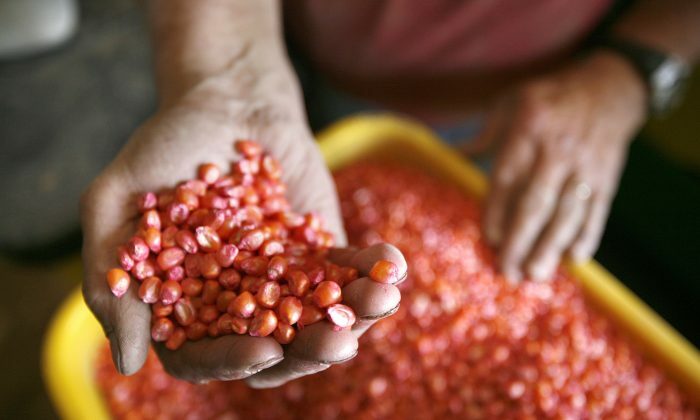 The chemical company, ChemChina, is just getting into the seed market with its acquisition. And BASF, previously the smallest of the six, would become even smaller by comparison. Representatives from five of the six merging parties (ChemChina was not present) testified at a recent Senate hearing examining the string of mergers. Each gave a version of the same message: that changes were necessary to ensure continued investment and innovation to feed the world, particularly as its population increases. They all talked about helping farmers with the latest science. In this industry, the incredible complexity of the technology and paths to market favor the most well capitalized. In the midst of a struggling farm economy, these agricultural giants are placing their bets on emerging gene editing technologies to keep them on top. If there is even a chance that shoppers will see the new technologies differently from conventional genetically engineered (GE) crops, it could allow the industry to move past another major hurdle. The most promising and well known of many new gene editing technologies is known as CRISPR-Cas. Science Magazine named it Breakthrough of the Year 2015, referring to it as a “molecular marvel,” capable of quick and precise edits of genomic material. Scientists also demonstrated it could be used to initiate a first-of-its-kind “gene drive,” which could potentially target and eliminate a disease-carrying mosquito if unleashed. While CRISPR-Cas was embraced early by the pharmaceutical industry for its potential to treat diseases in humans, seed companies are now seeing its potential for creating seeds more efficiently, which could reduce timelines for bringing products to market. It currently takes an average of 13 years and $136 million to bring a new seed to market, according to CropLife International, a biotech industry advocate. The vast majority of that time is spent on product development. “The speed with which these tools may help us to deploy crop improvements that would have traditionally been accomplished through plant breeding is exciting,” said Dr. Tom Adams, biotechnology lead for Monsanto, in an email. He explained that in traditional breeding, large amounts of “offspring” must be evaluated for the desired traits. With gene editing technologies, “instead of sorting through the haystack to find the needle, we can design the needle or make a smaller haystack,” said Adams. Further, if there is a chance that shoppers will see the new technologies differently from conventional genetically engineered (GE) crops, it could allow the industry to move past another major hurdle with consumer acceptance. Biotech crops are banned in large parts of the world, including Europe and Mexico, and consumers have been stubbornly wary of genetically engineered ingredients in food. The rapid-fire set of merger announcements do not come as a surprise to most industry watchers. During a recent congressional oversight hearing looking into the subject of consolidation in the U.S. seed and agrochemical industry, most expressed resignation as to its inevitability. Consolidation has been steady for decades, with the Big Six consuming a steady diet (over 200) of smaller seed, biotech, and chemical companies. The trend took off in the 1990s, with the commercial introduction of the first patented GE seed. The GE seed was different in that it was engineered in a lab setting to exhibit specialized traits that had been inserted into the seed from a foreign organism. Genetic engineering of seed is part of a paradigm of modern agriculture that involves patented ownership of genetic diversity (known as germ-plasm), and seeds produced using advanced cross-breeding techniques known as hybrids that are not able to be saved since they do not reproduce true-to-type. The advancement of seed ownership has reached such an extent in America that non-GE seeds are becoming increasingly expensive or hard to get, according to testimony from Roger Johnson, president of the National Farmer’s Union. Prior to the rise of agribusiness, federally funded land grant colleges and universities were the primary source of help to local farmers. The two groups would work together to improve seeds stocks and solve challenges. Today, land grant colleges are increasingly aligned with the interests of agribusiness, which fosters a dependance on herbicide and pesticide use. Doug Gurian-Sherman, senior scientist and director of sustainable agriculture at the Center for Food Safety, said there is an alternative method known as agroecology that is getting some important attention from land grant colleges, but that more work in this area needs to be done. Acroecology as a farming system reduces reliance on chemicals through the use of crop rotation, diversity, local adaptation of seed, and a focus on soil fertility that can control pests naturally, while still being as productive as GE crops. Monsanto has been researching gene editing for years, and has a number of licensing and R&D collaborations already established. In the last few months Monsanto has announced collaborations with TargetGene Biotechnologies for their novel “T-GEE” gene-editing platform, and Nomad Biosciences for an enabling technology that supports more efficient development of edited traits. On Sept. 22, Monsanto announced it had reached a global licensing agreement for the use of the CRISPR-Cas genome-editing technology in agriculture with the Broad Institute of MIT and Harvard. Broad holds several U.S. patents, and represents some of the pioneers in this field of research. Adams said gene-editing technologies have the potential to improve a number of crops within Monsanto’s current crop portfolio, with improvements ranging from disease resistance to flavor, but he withheld specifics, saying the research tools had not yet been deployed in the company’s R&D pipeline. Scientists and industry stakeholders are hopeful that regulators will treat gene editing differently. CRISPR-Cas is one of many new and more precise genetic editing tools that allow for targeted changes at pre-defined locations in plant DNA. Many of these new techniques involve inducing changes within the same organism, but the technologies can also be used to do conventional transgenic engineering more precisely. Earlier this year, a CRISPR-Cas edited waxy corn seed developed by DuPont Pioneer was allowed by the USDA without regulatory approval because the technology did not fit the criteria for a genetically engineered organism under the agency’s criteria outlined in 7 CFR part 340 of the Plant Protection Act. Gurian-Sherman said we should not read too much into the USDA’s decision, because the regulation contains a loophole that could change. There are also more than 30 past examples of products that were allowed by the USDA, even with the conventional techniques, he said. Scientists and industry stakeholders are nonetheless hopeful that regulators will treat gene editing differently. CropLife International argues in a position document that the new techniques “result in products which are similar or indistinguishable from products developed through traditional breeding methods.” It is calling for a lenient and globally harmonized approach. It is also calling on regulators to clarify their positions as soon as possible. DuPont Pioneer said in a press release it expected its “waxy corn hybrids” to be available to farmers within five years. The product would be one of the first CRISPR-Cas enabled agricultural products to be commercialized by any company. “This is just the beginning,” said Neal Gutterson, vice president of research and development for DuPont Pioneer, in the release. Dupont has established research collaborations and intellectual property licenses with Vilnius University and with Caribou Biosciences. In August of this year Bayer also signed an agreement with CRISPR Therapeutics to invest $335 million to create a joint venture named Casebia Therapeutics through which Bayer will have access to CRISPR technologies for agricultural applications. Dr. Fraley believes that to keep up with the overall pace of change in the world today, investment in agricultural technology needs to increase exponentially. “Our industry is changing … and it need to … because the solutions we need can only come if companies embrace new technology, increase their investments, and accelerate research and development,” said Fraley in testimony. Maywa Montenegro, a doctoral candidate at the University of California–Berkeley, said it will be important going forward to consider the intention behind the use of a new technology like CRISPR. CLARIFICATION: A previous version of this article mischaracterized the work of land grant colleges and universities and misattributed it to Doug Gurian-Sherman. Land grant colleges and universities are primarily focused on industrial agricultural systems, while a small but important part of their research deals with an alternative farming system known as acroecology. Epoch Times regrets the error.